??? Have you seen this block ??? The top photo is a colorful scrappy quilt made by my aunt. This is what started my searching for the name of the block. The second image I created in EQ7. It’s based on a 5 x 5 grid. 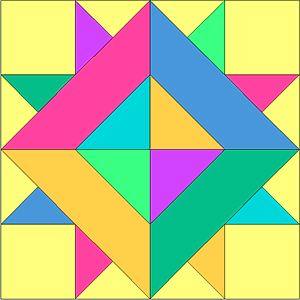 The finished size of the block is 10″ x 10″. TIP for EQ users: In EasyDraw, I set the snap points to 20 x 20. The only other place I have seen this block is in the book, American Country Scrap Quilts by Liz Porter and Marianne Fons. In their book they dubbed this block, “Original Star” (not a very original name — ha!). It states on page 72 that they could not find the block in any of their pattern source books. So I thought I would appeal to my cyber friends and see if anyone knows a name/source for this block. If you’ve seen it in other quilting books or magazines, let me know. One commenter suggested a name, “Noon and Night.” I cannot find that block in the block references I have on hand (see above). I did find one called “Noon and Light” in Yvonne Khin’s book (block #419). It looks similar, but the on point mitered square goes all the way to the block edge, and the triangles don’t have the overlapping look like in my aunt’s quilt. This entry was posted in Electric Quilt, Quilting and tagged quilt blocks, quilting. Bookmark the permalink. 7 Responses to Do You Know This Block? Also Known as Five Patch, Alice Brooks, unidentified newspaper clipping, date unknown. Susan, Do the blocks you mentioned have two different sized triangles in the corners? 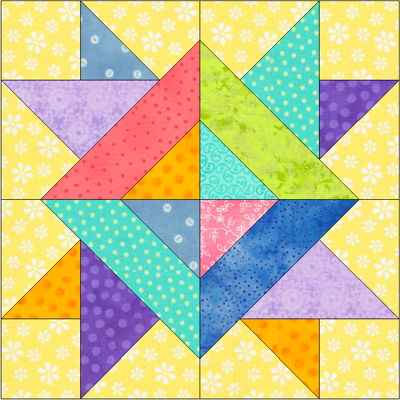 Does the mitered frame in the center go the edge of the block or is it away from the edge of the block like my Aunt Hazel’s blocks? Hi, I have tried to copy the exact image to paste here…. and I can’t seem to do it. But yes the triangles are different sizes and the mitered frame does not extend to the outside edge. It is made using a 10 x 10 grid. Wish I could forward the photo. Sorry. Hi Patti! I found my way here through your EQ7 Applique class on Quilt University. I searched for quite awhile and found a quilt like yours with the name “Noon and Night” here: http://www.bellwetherdrygoods.com/gallery.html It’s a little more than half way down the page. I didn’t find it in any of my reference books either. Susan is right — it is called Noon and Night and was a KC Star pattern. have you looked in the block encyclopedia put out by jenny byer couple years ago? these compendiums of blocks – & i have every one you mentioned and a couple more – don’t have ALL the blocks made, designed etc. i finally found reference to and info on one of my grand mothers quitl blocks in the byers book. the other i haven’t found anywhere yet except in old quilt magazine that was, unfortunately, lost in one of my frequent moves. Thank you so much for posting this; a friend of mind had a quilt top in this same pattern pieced by her great-grandmother. The ladies from our church finished it into a quilt, but none of us could find the name of the quilt block. We have been looking for six months. When I ran across your website and saw your quilt, I squealed with delight! 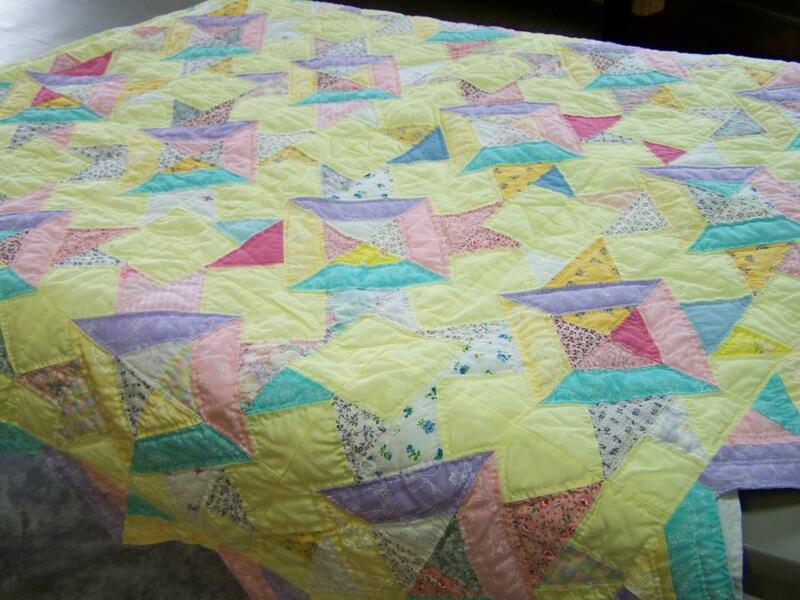 Its’ nice to know there is another quilt in this pattern out there. Thank you!